Independent Contractors need to focus on a few key points in their day-to-day operations. Reliance on traditional forms of reporting provides delayed results and is not advantageous for timely decision making. The critical measures associated with independent contractors are largely efficiency and materials based. It is essential that contractors recover both labor costs and material costs while keeping their overheads in check. That coupled with constant monitoring of their quote book will ensure that an adequate supply of work will continue into the future. KPI metrics accordingly comprise labor, materials and the quote bank. Tracking these on a weekly basis will ensure a greater understanding of the dynamics of your contracting business. Traditional accounting can then be viewed as a control measure to ensure the adequacy and correctness of these metrics. Consider an employee that works for 40 hours a week. Between annual leave, public holidays and other acceptable "leave", the amount of downtime in a year is six weeks. The cost of the employee is $50,000 per annum including all associated labor cost add-ons. 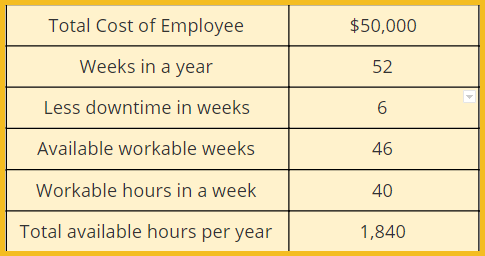 So if you can keep your employee "chargeable" for 100% of the time for every workable day of the year, then his cost per hour would be 50,000 / 1840 being $27.17 per hour. Now that's not impossible, especially when a "set job rate" paradigm is applied, but in most situations, 100% would be unrealistic. A more acceptable efficiency could be in the order of 80%. Hence, the employee cost per hour would then become $27.17 / 80%, that is $33.96 per hour. Add to that overhead recovery and profit expectations per hour and you'll end up with an acceptable and hopefully marketable hourly rate. Clearly, without tracking your efficiency, the results could be a little nasty. Knowing your efficiency will give you a good forward indicator as to your business practices. There could be many reasons for poor efficiency ranging from poor employee performance, poor job allocation, and poor quoting. The sooner you know the number, the sooner you can action any poor result by asking the "why" question. Materials are often another sleeper in contracting operations. Material controls and in particular some level of markup will ensure profitable materials deployment. It is essential that you at least recover the cost of materials (including waste) that you are employing on job sites. And preferably a markup in the order of 15%-20% should be targeted depending on your market segment. So what Key Performance Indicators (KPIs) do we need, and how do we get the information? Materials sales for the week (should be readily available on your invoices). Once you have identified what you need to target, obtaining the information should be readily straightforward. Maintaining the data can be handled by any back office person regardless of skill levels, and you would aim to have your KPI report on your desk by lunchtime Monday.